Prof. Yanchun Zhang is the Director of the Centre for Applied Informatics (CAI), and coordinates a multidisciplinary e-research program across the University. CAI's program focuses on application driven and multidisciplinary research involving collaboration among experts from different fields, particularly in the ICT area and its applications in health care, community, business, and environmental studies. Prof. Zhang is an international research leader in databases, data mining, health informatics, web information systems, and web services. He has published over 220 research papers in international journals and conferences proceedings, and authored/edited 12 books. Westgate General Practice Network, Melbourne. He has won VU's Medal for Excellence in Research in 2005, and the VU Vice Chancellor's Peak Award for Research and Research Training in Research Supervision in 2011, respectively. 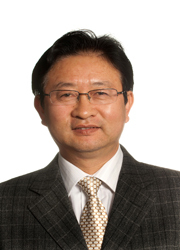 Prof Zhang was a member of ARC College of Experts from 2008 to 2010. He received the National "Thousand Talent Program" Award from China in 2010, and is currently a director on the Australia-China Joint Lab on Social Computing and E-Health, a joint initiative from Graduate University of Chinese Academy of Science and Victoria University.